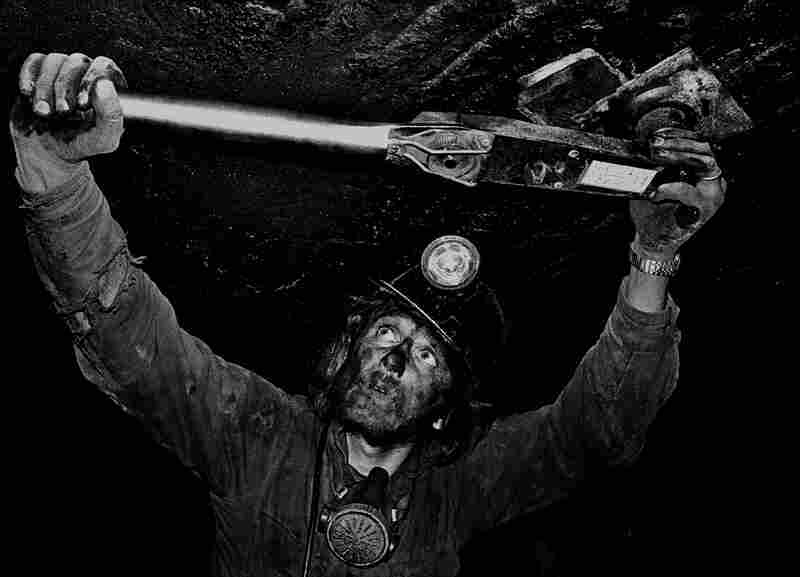 Documenting 'Dirty' Jobs: Miners At Work : The Picture Show Photographer Earl Dotter has spent more than half of his life documenting workers in the most hazardous conditions. Buck Koptchak tests the torque on a coal mine roof expansion bolt in Clearfield County, Pa. Two years earlier, his father was killed doing the same job. A coal cutting machine operator said spending a shift in a 30-inch low coal mine "is a bit like working under your kitchen table all day." A coal miner in a classic posture walks by the bits of a continuous mining machine in Clearfield County, Pa., in 1976. 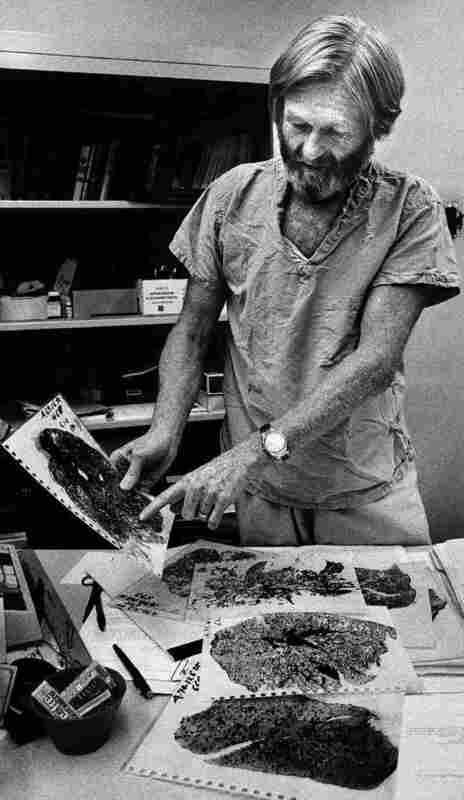 Dr. Donald Rasmussen examines lung sections from coal miners who died from black lung disease in Beckley, W.Va., in 1977. Rasmussen is still the leading black lung doctor in the region. 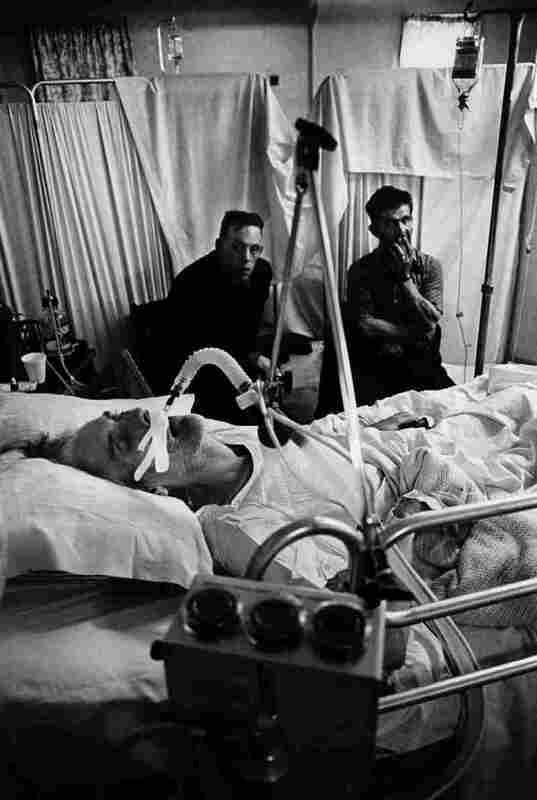 A black lung victim nears his last breath. 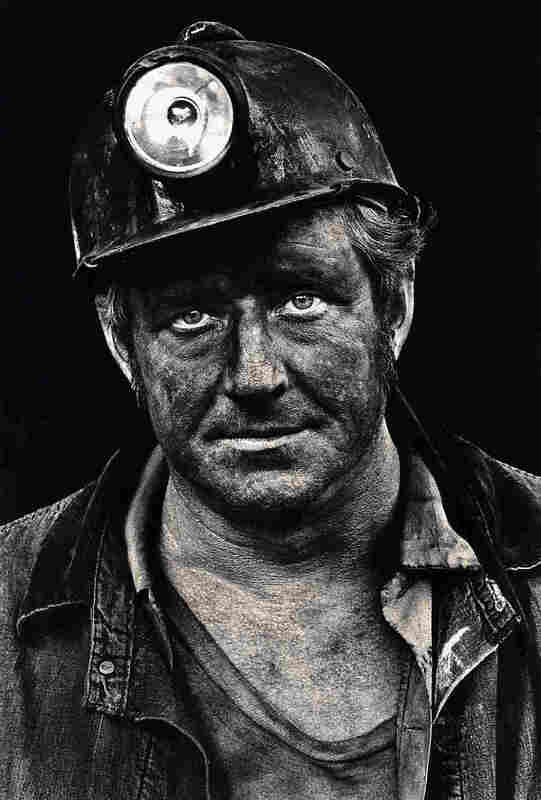 His sons, also coal miners, keep vigil. 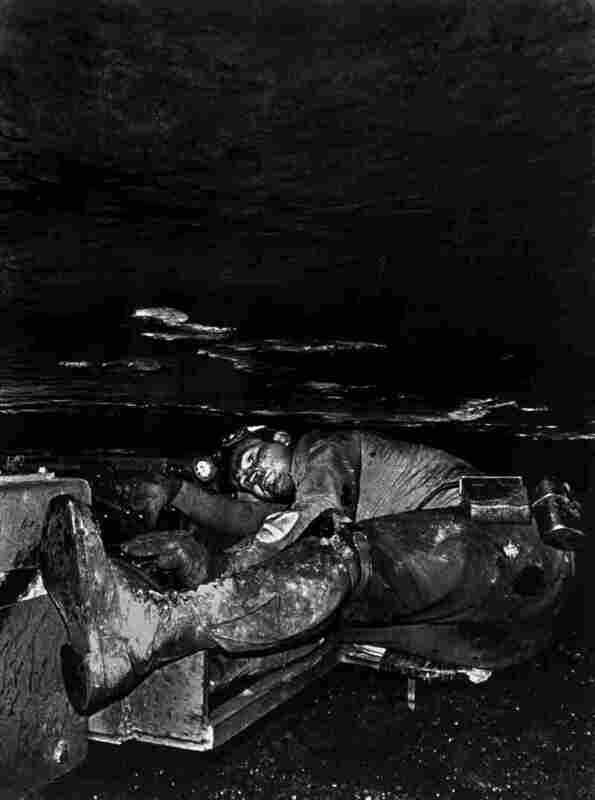 In 1998, NIOSH estimated that 2,000 miners died annually from lung diseases caused by exposure to coal dust. 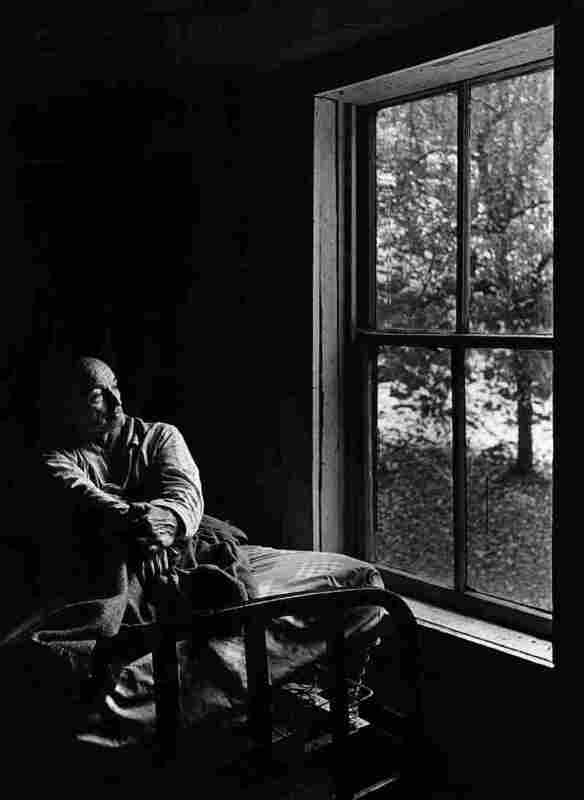 Oroville McCoy recalled his earlier years as a healthy, active outdoorsman before black lung left him bedridden in McDowell County, W.Va., in 1976. 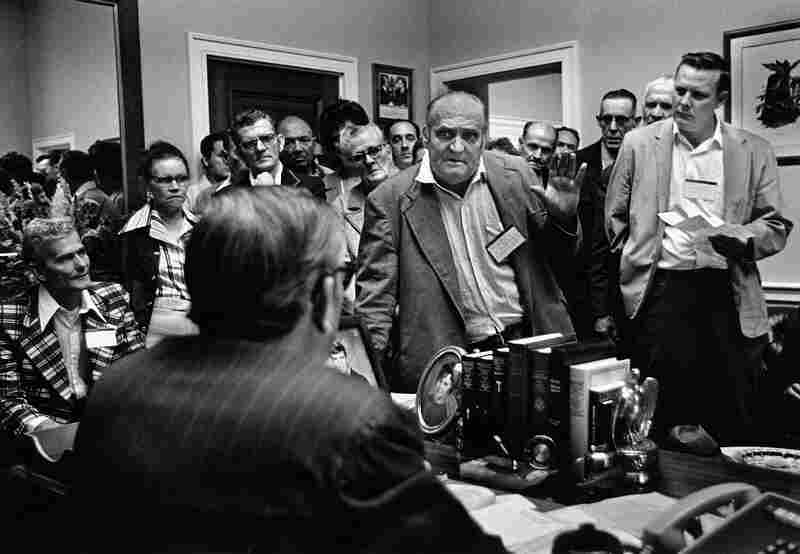 Disabled coal miners and widows confront their Kentucky congressman's poor record of supporting black lung legislation in Washington, D.C., in 1975. Coal miners rally for black lung law on the steps of the U.S. Capitol in 1975. That book was a souvenir from a trip to a Pennsylvania coal mine. And I thought of it the moment I saw the work of Earl Dotter. 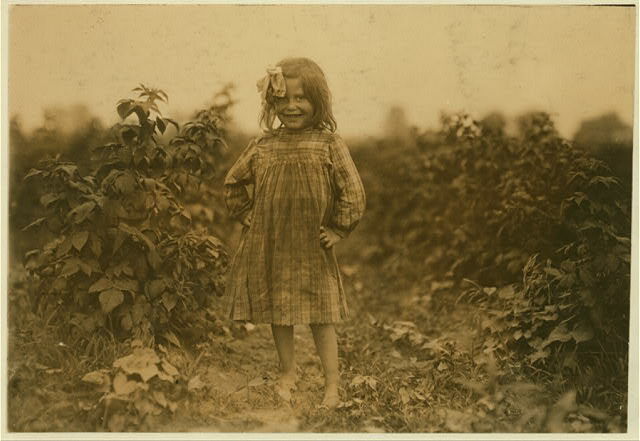 While most Americans spend a third of their lives at work, Dotter has spent more than half of his documenting workers as a photographer. His interest in hazardous work environments began in the late '60s, when he was first introduced to the coal mining community while volunteering in Tennessee. At that time, a coal miner was killed nearly every day, according to the Mine Safety and Health Administration. Coal miner Lee Hipshire in 1976, shortly after emerging from a mine in Logan County, W.Va. at the end of his shift. At age 36, he had worked 26 years underground. A few years later, Lee took early retirement because of pneumoconiosis, or black lung disease. He died at 57. Lee Hipshire was 36 when Dotter shot Hipshire's portrait at the mouth of a mine entrance, the dark hole behind him accentuating the grit of his face. Hipshire worked a "dirty job," says Dotter, shoveling loose coal onto conveyor belts — and as a result had developed lung issues. "Lee was a handsome fellow, and when I asked him to pose for a portrait he looked right into the camera, right into my eyes," Dotter recalls. "Sometimes it's just someone's desire to be treated with self-respect and dignity that is conveyed." Hipshire died when he was 57 from a heart attack, catalyzed by the strain of black lung disease. 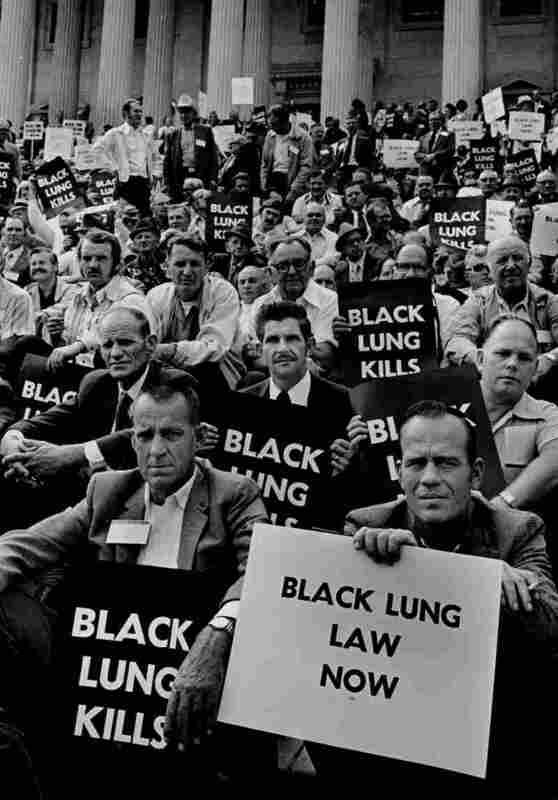 Legislation since then has brought about widespread changes in workplace safety, and cases of black lung have declined. But a recent investigation by NPR and the Center for Public Integrity reveals that cases of black lung are once again on the rise, especially in younger miners. According to federal data obtained by CPI and NPR, the average workweek for miners grew 11 hours in the past 30 years, adding about 600 hours of exposure each year. Coal miners in 1976 (left) and 2011 (right) wait to be tested for black lung. 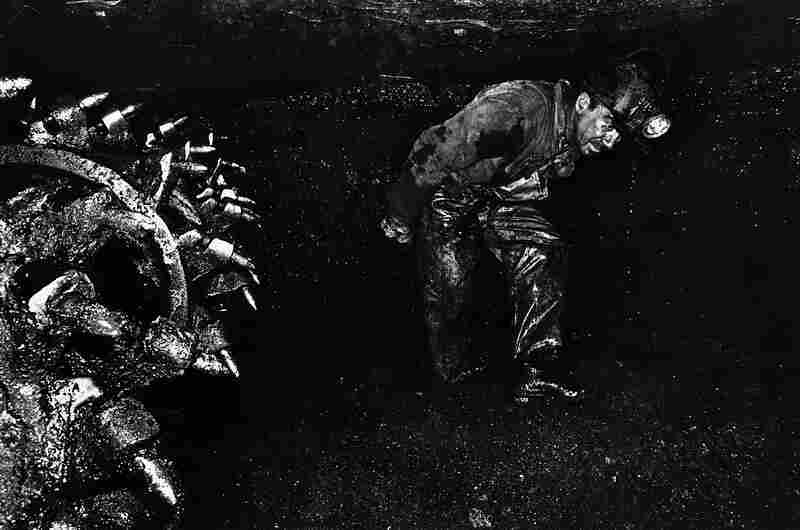 Dotter continues to document coal miners. Today, the tests for black lung are a little different, and the artwork on the waiting room wall has changed. 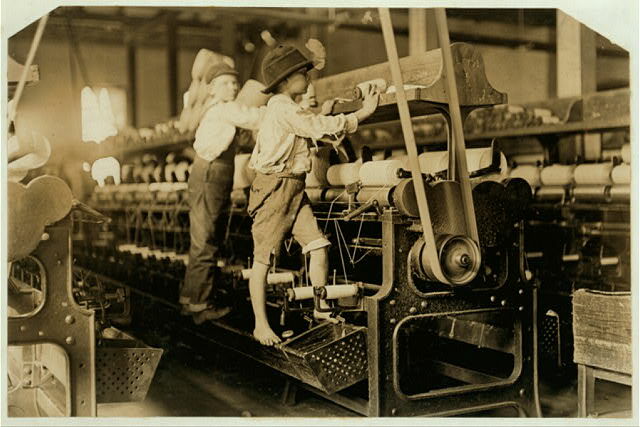 But the toll on the workers struggling to catch their breath is not only the same — it may be worse.